You don’t necessarily have to consign yourself to minivan hell when you have kids. Lamborghinis and Ferraris make for lovely ways to transport a growing family. Here’s how. On a lovely autumn day in 2006, I folded myself out of the back seat of my friend Larry’s Lamborghini Espada and had a revelation: I have just found the perfect family car. Orosz, get your head out of the mushrooms, you might be thinking, the Espada is a 40-year-old Italian rustbucket, but see, it all makes sense. The car is Marcello Gandini’s trickiest design—the svelte coupé profile obscures two flawless, roomy back seats, either of which will accommodate my 6'2" frame with ease. Fitting a child seat in there would be a walk in the park. The Espada also makes a very pleasing noise, is not very expensive at around $40,000 for a driveable example and most importantly, it comes with a cubic mile of style. Based on my rudimentary knowledge of developmental neurophysiology, a child exposed to such a stylish means of transport in her formative years will develop impeccable taste. And a sense for the benefit of extreme speeds. To test my theory, I went for a stroll in Knightsbridge, London’s perhaps poshest neighborhood. Specifically, the streets around the famous department store Harrods, where the local ultra-rich do their weekend shopping. The first car I ran into that fit the bill was a midnight blue Ferrari 456. This is very similar to the Espada in that there is a V12 up front, two doors on the sides and four seats on the inside. Ferrari introduced it in 1992 as the replacement for that eyesore 400 and made around 3000 of them until the 612 Scaglietti took the stage as Ferrari’s resident leviathan. It’s a beautiful, compact car, and in spite of the fact that the good people of Knightsbridge receive ultra-high doses of supercar every single day, it still drew looks. The inside is your typical all-leather Ferrari affair—but it showed no signs of occupation by minors. Little wonder: the rear seating area is way less voluminous than that of the Espada. You would need to have kids with very short limbs to feel comfortable back there. The Knightsbridge crowd thought the same: a couple stopped by to consider it as perhaps their next family ride, but upon seeing the interior, they promptly walked off. Of course unless you have twins or more than one child, you won’t need a four-seater right away, and if you live in Knightsbridge, your spouse probably has her own supercar. What you need is a grand tourer. And show me a grander tourer than the Ferrari 599 GTB. It was parked in front of the World’s Easternmost Krispy Kreme Franchise: a favorite haunt for those who have gotten hooked on this wonderful Southern suspension of fat and sugar, yours truly amongst them. 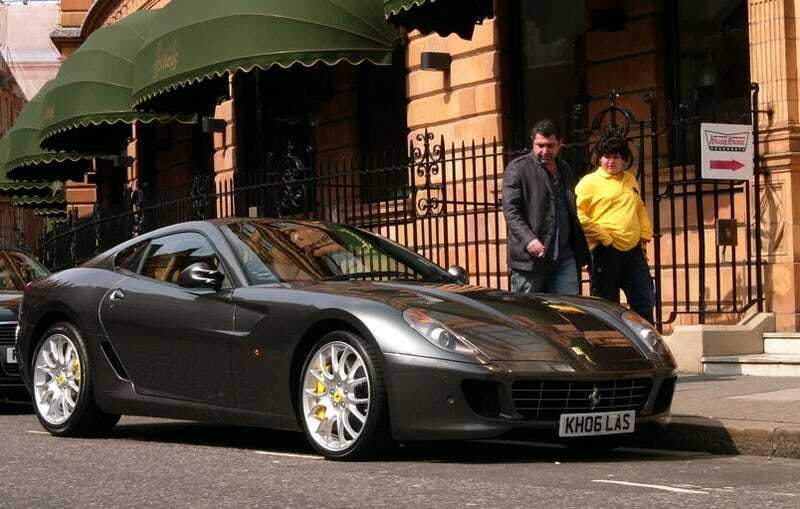 Unlike the Espada, the 599 is definitely not a reasonable choice. You will be charged a quarter million dollars to own this rocketship with its archways of aerodynamics. But consider: putting your child through a good college and graduate school runs up a tab very much in that neighborhood—and there’s no guarantee that she’ll have a happy and productive time. Alternatively, you can spend that money on a 599. Her hearing will develop in a vat of high-strung V12 engine noise. Her sense of balance will be trained by the sudden instances of acceleration and deceleration produced by the 611 horses up mid-front and the humongous carbon ceramic brakes in the corners. She will smell gasoline and premium leather. All in all, the perfect way to nudge her central nervous system in the right direction. As I was considering all this, the smell of Krispy Kremes became overpowering. I followed my zombified brain inside and introduced four glazed donuts into my body. A few minutes later, giddy with the sudden overload of sugar, I stumbled outside to see the Ferrari already gone. Inside traveled a small child, her brain happily soaking up every component of that magic which Ferraris are made of, constructing all the right synapses for a balanced adulthood. Next up, we’ll look at a Ferrari 612 Scaglietti and a real, live kid who rides in the back.